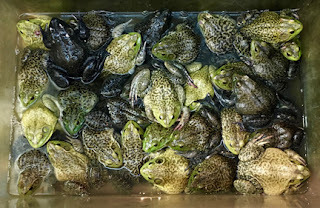 A bin full of live frogs. Asian Supermarket, Colonie, NY. We have fond memories of Frog Legs Provençal, the introduction to our first meal as a employee of The Culinary Institute of America, ages ago. Of course we’d eaten frog legs before, but they were not nearly as elegantly prepared or served. For example, sometime before, we had brought home a bag of live frogs to process into dinner. Our (then) girl friend walked in—saw the throbbing bag that was trying to hop off her kitchen table—and developed a sudden urge to become a vegan. We have other froggy memories, even less savory, such as time we stepped on half of a frog that had been left for us—quite thoughtfully—by one of our cats. We were, at the time, wearing our favorite pair of bare feet. The precise memory of cold, moist amphibian innards squeezing up between one’s toes does not fade with time, we might add. Assuming that you’re pretty much sated with froggy memorabilia by now, we can move on to other news. Roll Magazine published “Preserving Food, Preserving Culture,” an adaptation of parts of the introduction to Can It! The Perils and Pleasures of Preserving Food, along with three recipes from the book. Aside to On the Table insiders: “Preserving Food, Preserving Culture” was my working title for the book. The publisher’s marketing team created the final title. This month’s quotes (from On the Table’s culinary quote collection) returns—you’ll be thrilled to learn—to this month’s amphibian theme. PS: If you encounter broken links, changed URLs—or know of wonderful sites we’ve missed—please drop us a line. It helps to keep this resource as useful as possible for all of us. To those of you who have introduced us to sites like the ones in this newsletter (such as Rachel Laudan, who has been very busy lately), thanks, and keep them coming! Can You Spice Up a Meal Just by Changing the Soundtrack? Food of the Gods: Cure for Humanity? How is Reviewing a Restaurant Like Reviewing a Book? What’s It Like to Be a Food Writer Right Now? Occasionally, the URLs we provide may link to commercial sites (that is, they’ll cost you money to take full advantage of them). We do not receive any compensation for listing them here, and provide them without any form of recommendation—other than the fact that they looked interesting to us. It’s easy. Whenever you want to shop on Amazon, click on any of the book links below, then whatever you buy there will earn a commission for this newsletter without adding to your cost (it doesn’t even have to be one of our books). These newsletters merely update the contents of the book; what doesn’t appear here is already in the book. The Resource Guide for Food Writers, Update #192 is protected by copyright, and is provided at no cost, for your personal use only. It may not be copied or retransmitted unless this notice remains affixed. Any other form of republication—unless with the author‘s prior written permission—is strictly prohibited.